During a short inspection tour around the exhibition halls in the museum, Minister of State for Antiquities Zahi Hawass announced that the seventy objects broken during the foiled looting attempt will be back to their original condition within five days, following comprehensive restoration. Restoration was also carried out on a statue depicting the boy-king Tutankhamun on a panther. He pointed out that procedures are now being taken to re-open all the archaeological sites around Egypt. Hawass told Ahram Online that reports being published in the media claiming that the Memphis, Saqqara and Abusir necropolis were plundered are untrue. These sites, he continued, like all archaeological sites in Egypt, are safe and have not been looted. The tombs of Maia, and those belonging to the two brothers, Mereruka and Tiye, in Saqqara, which some newspapers claimed had their paintings damaged, proved inaccurate. These tombs are safe and sound. 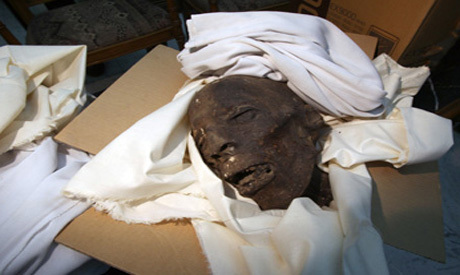 He also asserted that the two mummies that were reported as damaged in the museum, were in fact unidentified late-period skulls and not royal mummies. They were temporarily stored inside the gallery, next to the CT scanner laboratory. “When they were retrieved from the thieves on their way out of the museum, the skulls were in the same condition that they had been in storage,” Hawass confirmed.